The teen fashion retailer, under fire for giving workers a day's notice they would lose their jobs, finally issued a statement on the layoffs this morning. This photo from redditor DevoidSauce, taken Sunday at a Wet Seal in Seattle, has gone viral. Wet Seal, which has refused to respond to press inquiries regarding the abrupt closures and layoffs, said in a statement today it closed 338 stores — or 64% of the 528 stores it operated as of Nov. 1, 2014. Last month, Wet Seal told investors it planned to close just 60 stores by Jan. 31. The teen fashion retailer also said it terminated 3,695 full- and part-time employees, some of whom received just one day's notice before losing their jobs, and despite weeks of reassurances from the company that stores would not close. "This was a very difficult decision to make, but after reviewing many other options since I returned to the company in September, our financial condition leaves us no other alternative than to close these stores," Chief Executive Officer Ed Thomas said in today's statement. "This is an extremely difficult time for the entire Wet Seal team, and we are doing everything we can to protect the interests of all of our stakeholders, including our employees. We acknowledge and sympathize with how hard these recent events have been on our employees, both those staying with the company and especially those who are leaving the company this week." Wet Seal said following the closures it will now run 173 stores and its web business. The struggling chain has been criticized roundly for convincing employees the business was doing fine throughout the month of December, then abruptly firing thousands of employees via a surprise Friday conference call, giving workers a day's notice in many cases. Former employees told BuzzFeed News that many of them learned of the layoffs from other stores, or from receiving boxes to mail back IT equipment such as cash registers. Higher-ups assured employees that inventory was on its way and that massive sales were typical. 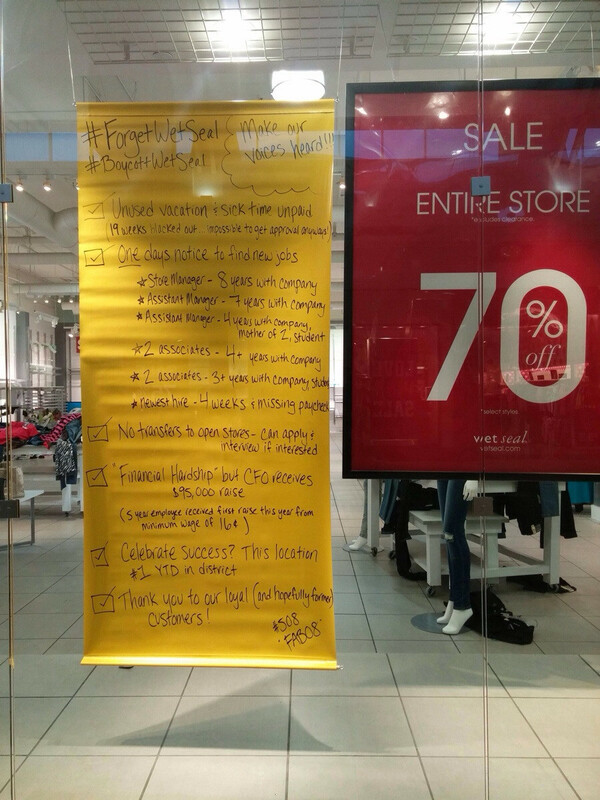 Wet Seal said its severance and "one-time termination" costs will be about $700,000. The company has also been criticized for giving its CFO a nearly $100,000 raise the day the layoffs were communicated to store managers. The chain said the closing stores accounted for nearly half of its sales, which are typically in the range of half a billion dollars a year. Wet Seal has been struggling, in recent years, to identify its target customer, fluctuating between selling to middle-schoolers and college students. FOOTHILL RANCH, Calif.--(BUSINESS WIRE)-- The Wet Seal, Inc. (Nasdaq: WTSL, the "Company"), a leading specialty retailer to young women, today announced that it was closing 338 retail stores effective on or about January 7, 2015. The Company decided to proceed with the store closures after assessing its overall financial condition and the Company's inability to successfully negotiate meaningful concessions from its landlords. The store closures unfortunately resulted in the termination of approximately 3,695 full and part-time employees. The Company estimates that the 338 retail stores which were closed represented approximately 48 percent of its net sales for the nine months ending on November 1, 2014. Following the store closures, the Company expects to operate approximately 173 retail stores and its Internet business. Ed Thomas, CEO of The Wet Seal, Inc., stated, "This was a very difficult decision to make, but after reviewing many other options since I returned to the Company in September, our financial condition leaves us no other alternative than to close these stores. This is an extremely difficult time for the entire Wet Seal team, and we are doing everything we can to protect the interests of all of our stakeholders, including our employees. We acknowledge and sympathize with how hard these recent events have been on our employees, both those staying with the Company and especially those who are leaving the Company this week." In connection with the Store Closures, the Company expects to incur estimated pre-tax charges ranging from an aggregate of $5.4 million to $6.4 million, including costs associated with inventory write-off, asset impairments and employee terminations. Charges associated with inventory write-off are estimated to range from $2.5 million to $3.5 million. Charges associated with asset impairments (consisting primarily of write-offs of fixtures, furniture and equipment at the impacted stores) are estimated to be approximately $2.2 million. Charges associated with employee severance and other one-time termination costs arising from the Store Closures are estimated to be approximately $0.7 million. Such estimates do not include any claims or demands which may be made by the landlords of the impacted stores for unpaid rent or otherwise. The above charges are estimates and the actual charges may vary materially based on various factors, some of which may be beyond the Company's control. See "Safe Harbor Statement Under the Private Securities Litigation Reform Act of 1995" below. About The Wet Seal, Inc. The Wet Seal, Inc., a pioneer in fast fashion retailing, sells apparel, footwear and accessories designed for teen girls and young women of all sizes through retail stores nationwide, as well as an e-commerce website. After the store closings, the Company expects as of January 9, 2015 to operate a total of 173 stores in 42 states and Puerto Rico and an e-commerce business at www.wetseal.com. For more company information, visit www.wetsealinc.com.